Detailed, customized reports are a critical tool for attracting and retaining HNW, UHNW and institutional investors. After all, reports are one of the few tangible things clients receive from any investment firm. Yet creating and distributing reports can be a time-consuming task — especially when a large number of complex accounts are involved. 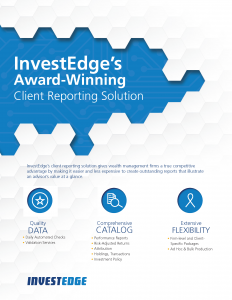 As many of the industry’s leading firms have discovered, InvestEdge’s award-winning solutions serve a critical role in meeting the most demanding reporting requirements. In addition to making it easier and less expensive to create outstanding presentations — the system provides true competitive advantage.